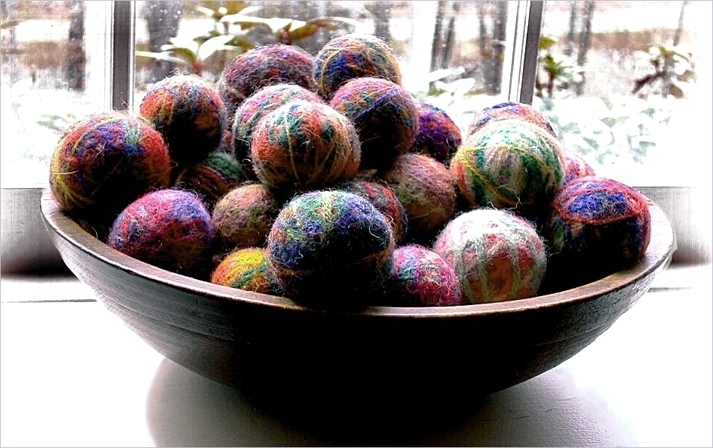 BOWL OF BALLS MADE FROM DRYER LINT AND WOOL THREAD. You know I am all about recycling, and I wash old sweaters and other woolens until they shrink and become thick wool felt. One byproduct is what gets left in the lint trap: lots of wool fluff. I can't possibly throw this away! So, I make wooly balls, and sometimes I turn the wooly balls into wooly ornaments. If you would like to try this, but you don't happen to be washing, and ruining, dozens of sweaters, you can use wool roving. Pick whatever color appeals to you. Grab a large handful and shape it more or less into a ball. Then wrap wool thread around it. Stuff this sloppy ball into the bottom of a stocking, and tie a knot - the process of pushing while you tie the knot will improve its shape. If you want to make more than one, just keep repeating the process until you have used the entire length of the stocking. At this point you can call it a garland and quit. But if you hang that garland in your living room, your family may have you institutionalized. Now throw your weird garland into the washing machine and let it start - hot water and just a bit of soap. After about five minutes, you need to check on how things are going. The wool will start to felt and if you let it go on for too long, the nylon stocking will become embedded in the balls. Yuk. Once your balls (ha, ha I said "your balls") have felted as much as they can without grabbing onto the nylon, it is time to remove them from the washer and finish them off by hand. Remove the balls from the stocking and rub them against something rough, like an old-fashioned washboard. You do this while keeping them hot, wet and soapy. They will "harden off" and become nice, tight, hard balls. That's really the most difficult part of the process - takes lots of elbow grease. Once you have the finished balls, you can either enjoy them as is, or dress them up with ribbon, buttons, bells, and what have you. Above all - have fun doing this! Although, during the hardening off process, you may wonder if it's worth it!